A men’s dress watch or ladies’ timepiece, the Radiomir 1940 3 Days Acciaio 42mm PAM00574 and PAM00575 are the first watches to feature Panerai’s new calibre P.1000, a hand-wound movement with a zero-reset seconds. 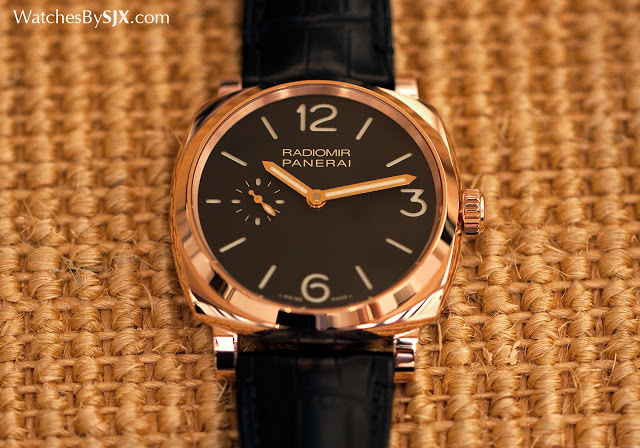 A recent addition to the Panerai collection, the Radiomir 1940 3 Days Acciaio 42mm is the smallest watch in its line-up, and it’s equipped with the new P.1000 movement. It’s also notable because the steel version, the PAM574, is paired with a lime green strap, making it a ladies watch in all but name. The new Radiomir 1940 3 Days Acciaio 42mm succeeds the references PAM512 and PAM513 introduced in 2013, both identical in size but more masculine in styling. While the discontinued PAM512 and PAM513 used the P.999 movement made by Piaget, their replacements have the in-house P.1000. 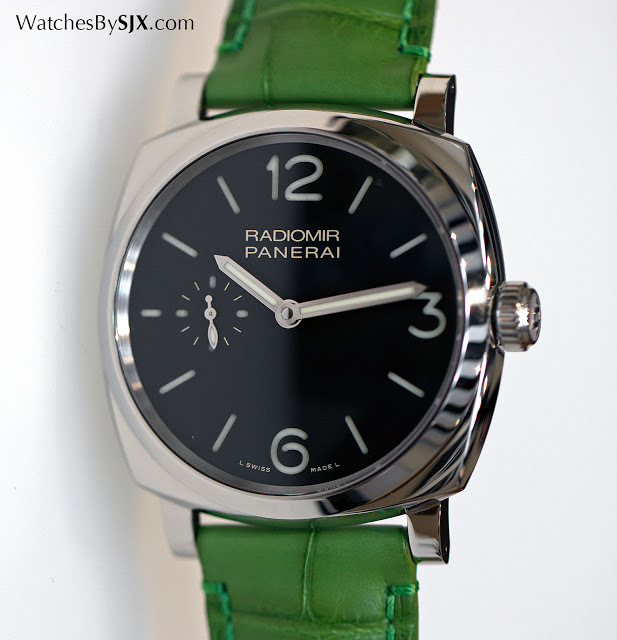 Though not explicitly described as a ladies’ watch, the Radiomir 1940 3 Days Acciaio 42mm PAM574 looks like one. It has a stainless steel case, black dial and gilt hands, along with a pale green Super-Luminova that matches the lime green strap. On a black or brown strap this would immediately look like a conventional military-inspired Panerai, and a watch for men, but this combination is more slanted towards the female clientele. Exactly the same size but more masculine is the Radiomir 1940 3 Days Oro Rosso 42mm PAM575 in red gold. This is also 42mm in diameter, but the combination of a red gold case, black dial and black strap give it a strong contrast. 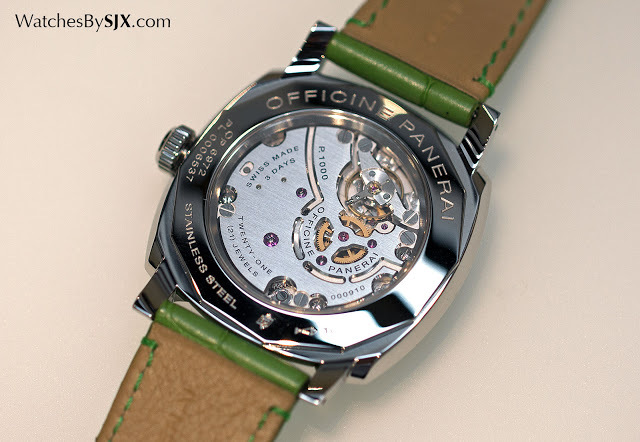 At 42mm both watches are small by Panerai standards, but sizeable enough compared to everything else. 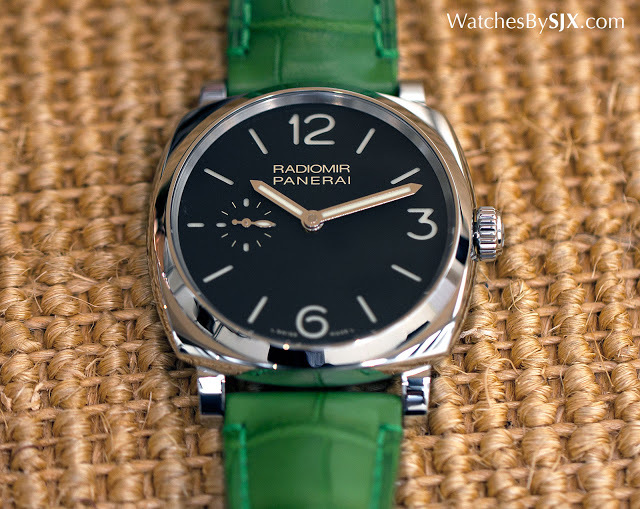 While the steel PAM574 is passable as a ladies’ watch, the PAM575 might do as a men’s dress watch, albeit a largish one. 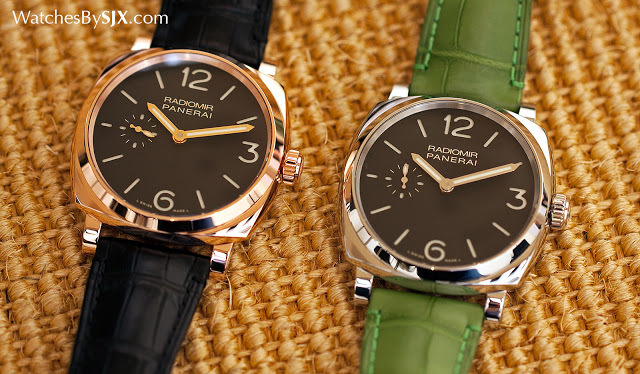 Both the PAM574 and PAM575 are not quite typical Panerai watches, yet they are not entirely the watches they seem to want to be, which begs the question why? The obvious answer is to broaden the appeal of the brand, to bring in those who do not want a large wristwatch that looks like it’s going to war. The new calibre P.1000 Aesthetics aside, both watches are powered by the P.1000, a new movement that is an upgrade over the P.999 it replaces. Hand-wound movement with a three day power reserve, the P.1000 is finished in a manner typical of Panerai movements, with straight brushed finish on the bridges and shiny, diamond-cut bevels. Large apertures have been cut into the three-quarter bridge to show part of the gear train, giving it some visual appeal. More importantly, the P.1000 has a useful zero-reset seconds for more precise time-setting: pulling the crown brings the seconds hand to 12 o’clock, and it remains frozen there until the time is set and the crown is pushed back in. 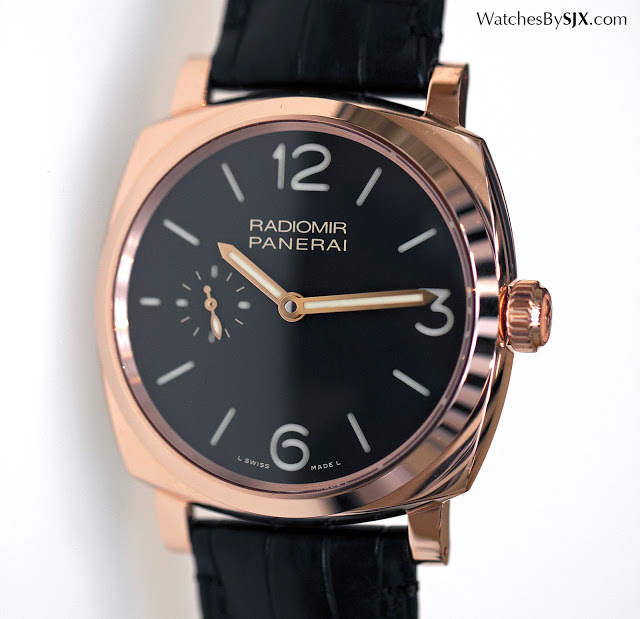 Pricing The Radiomir 1940 42mm in steel is €7400 or S$10,900, while the red gold version is €17,600 or S$25,900. Singapore dollar prices include 7% tax.